BizSugar.com › Marketing	› Are You Making Mistakes That Are Sabotaging Your Blogging Profits? 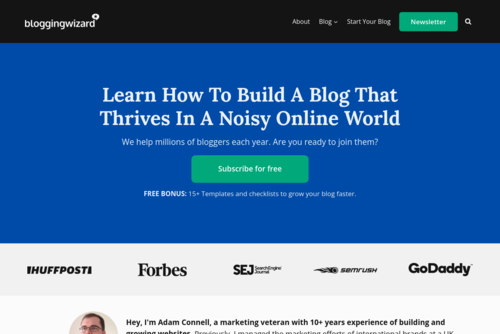 Are You Making Mistakes That Are Sabotaging Your Blogging Profits? "A select number of bloggers are making serious amounts of cash while others fail to get off the ground. What are those successful bloggers doing that others aren’t? The truth is that small design changes can have a huge impact on conversion rates and that means more sales. In this post I’ll talk you through 10 of the biggest conversion killers. I’ll also show you how you can sell more of your products and services than you thought possible." Adam: Thanks for the link! I have signed up for MailChimp's entrepreneur account. I have added a sign up box on my podcast site, EGO NetCast. No worries, Martin - great to hear! Adam: What is your experiences with this service? Have you written a blog post on it? Adam: Thanks for your input and suggestions. I appreciate it very much. I look forward to our future podcast conversation. Have you tested Lead Pages? I am a divided regarding the transcripts. It takes a long time to write it down, word by word. And if you outsources it could cost plenty of money. BlogTalkRadio is charging $2 per minute, so I would pay USD $120 for 1 hour podcast interview. Yesterday I listened to a webinar with Lead Pages and Chamber of Commerce. I received some great tips and I got inspired to look into this matter more. No worries, I'm sure there are some better options somewhere, still may be costly. Alternatively you could put together a set of resources for each podcast and offer that to build your list. Transcript would definitely be better. Ultimately the key will be planning out a strategy to monetize your email list to at least cover costs, then scale up to make some profit! Adam: Thanks for sharing this post by Geoff Austin. I would like to talk with you during 2015... ;) Please check out how my podcast site is developing. I will add a support and contact page, although I already have this information and call to action button available on the front page. No worries, Martin. Looks to be developing well. I'd recommend switching to a strong focus on building your email list - for example, James @ SuperFastBusiness offers transcripts in exchange for email addresses. Email will be key in building your audience.